My recent work has swayed more towards the cityscape genre, which has been a daunting and challenging task at first, but very rewarding and something I strive to master to my fullest potential, but I know deep down my heart will always reside closer to the roots that shaped me as an artist. I’ve had no training in my art other than that of Mother Nature; sketching and gathering information from my closest outdoor surroundings in the rural area where I grew up – is where my journey began. 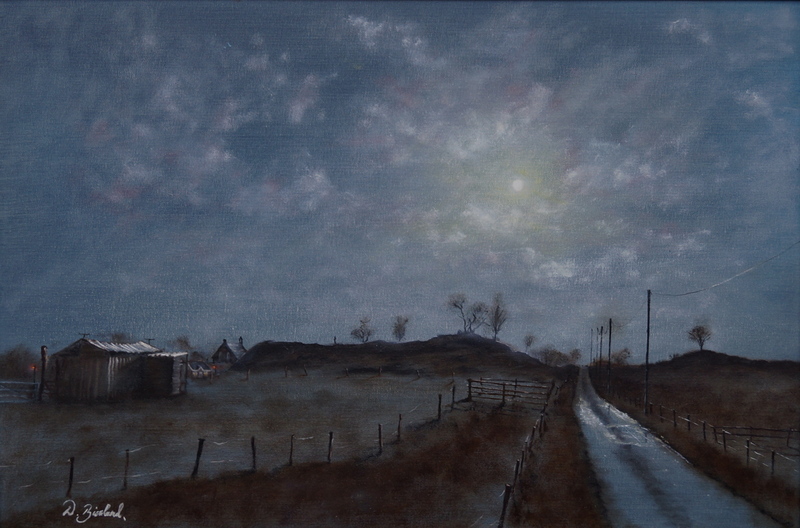 “Moonlight in Longriggend” was my first ever moonscape, the long road you see I have walked a thousand times, under many moons, the horse shed has many stories best left untold, the scene itself is literally 100 yards from my childhood home. The hill you see was an old coal bing one hundred or so years back, this place would have been full of life then, the road would have been lined with houses for the workers, which are now completely gone, a stark contrast to the desolate, silent, forgotten place its has now become. I aim to capture that silence. The initial study for this was done during daytime just to get the composition how I envisioned, the colours, moonlight and atmosphere are all from imagination and to be honest I could probably have done the whole scene from start to finish from imagination as I know it so well. When I look at this piece, which was painted many years ago, I sometimes feel I haven’t progressed much in my work, maybe I’ve strayed too much from the path that was meant for me, maybe I’m just too self-critical. I doubt I will ever sell the piece and while my mother is still alive and I doubt I’ll ever have the choice! She has it proudly hanging in her living room. It’s actually a piece I’m quite proud of, as what I envisioned appeared so well on the canvas – something I rarely achieve.